I have books stashed all over the place—one in the car, one by the bed, one in the private library—so that I always have something to read while my engine is idling. Recently, I made the mistake of reading Thomas Pynchon’s Gravity’s Rainbow and Donna Tartt’s The Goldfinch at the same time. Way, way too many drugs. Narrators flying all over the place. (I’m now in recovery with more sober selections.) Tartt’s novel, being contemporary, wasn’t on my Gap List, but the third selection in my altered states themed reading adventure, George du Maurier’s Trilby, was. This fun little novel isn’t widely read now, but it was The Da Vinci Code of 1894. The three young gentlemen at the heart of the novel are British artists living in the Latin Quarter of Paris in 1860 or so. The fourth member of the quartet is an artists’ model named Trilby O’Farrell. She’s generous, funny, free spirited and of course they are all at least a little in love with her, one of them truly, madly, deeply. The utterly and obliviously tone-deaf Trilby flees the Latin Quarter and disappears. Time passes and she is discovered by the artists (now respectable and living back in England) to be the latest singing sensation sweeping European concert halls as La Svengali. The name Svengali remains with us as a term for a mentor with inappropriately controlling powers, for Trilby’s profoundly creepy husband/handler uses mesmerism—hot and trendy in the fin de siècle—to train her to sing as no diva has ever sung before—like him, if could sing like a girl. Anti-semitism warning: Yeah, it’s wild. The drug trips are the least weird thing about this book. 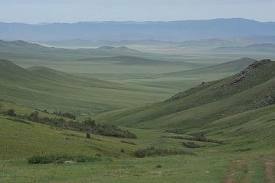 In a nutshell, a man discovers that there is some mysterious biological connection between himself and a particularly terrifying missile deployed by the Germans during WWII. He is not the only one to have associated his erections with the missile’s guidance system, and as he escapes from conspiracy to wider conspiracy, his personality disintegrates. The cast of characters is huge, shifting, doubling, ghostly, comic, and includes a semi-divine light bulb. This book is hard. I’ve read several critical analyses, hoping one of them would illuminate some of the more obscure points, but haven’t had a whole lot of luck so far. Probably, I will end up making another pass at this one, because I have theories that nag at me like an unfinished logic puzzle. Or a Flannery O’Connor short story. But, as I said, I am for now enjoying the solid, earth-bound good sense of a second-tier Victorian. 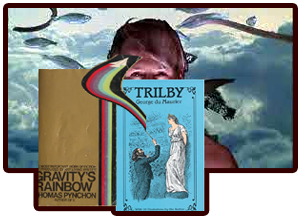 This entry was posted in Closing the Gap List and tagged Book review, books, George Du Maurier, Gravity's Rainbow, Literature, Thomas Pynchon, Trilby on March 7, 2014 by janetlong.